A Cornish National Trust property will be the setting for an unusual trip back in time this weekend. 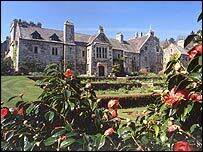 Cotehele House in east Cornwall will play host to the Tudor re-enactment group, the Hungerford Household. Its members will be taking over the property on Saturday and Sunday providing visitors with a glimpse into life in the county in the 16th Century. There will be a chance to prepare food, make textiles and even have a go at peasant and court dances. There will also be the opportunity to learn combat and defence moves from the Tudor era. A variety of children's activities will be on offer, such as weaving and tassel making. Cotehele's services manager, Charmian Saunders, said: "This will be the second year that Cotehele has held a Tudor living history event. "Last year's event was held on a single day, but it proved so popular that we have extended it to a full weekend. "This type of event really brings the history of Cotehele to life and proves to be a great way to tap into the imagination of both young and old." The building, which is at St Dominick, near Saltash, is a medieval house with collections of textiles, armour and furniture. It was built mainly between 1485 and 1627 and is at the heart of an extensive riverside estate.